Is Your Office Getting Ready to Update Its Large Group Meeting Spaces? By adding a few artwork pieces, you can control the atmosphere and mood of the room. Decorate your office, conference room, or lobby with unique mounting styles sure to complement any space. 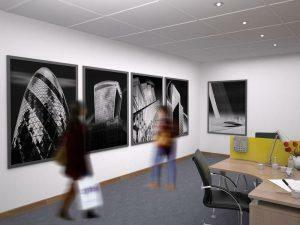 If you want to set your company apart from the competition, displaying magnificent and complementing office wall art in your office is a good way to differentiate yourself and your organization. I aim to serve clients looking for good quality office art with prices that are highly competitive and attractive to everyone’s budget. So if you are ready to turn your office into a presentable and welcoming place, start shopping at my online store today.